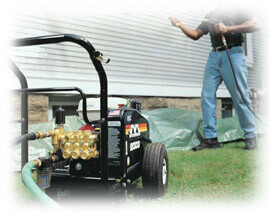 Some of the most effective pressure washers are the hot water models. These machines are excellent for cleaning heavy grease and grime. The machines will heat the water up to 200 degrees F. The hot water will act as an abrasive so that the dirt will loosen. Restaurants: restaurants have a lot of grease that accumulates on equipment. Hot water is essential to clean this thoroughly, so these machines work well for this type of business. Construction sites: can use hot water pressure washers to clean up their equipment as they can have a lot of dirt, grime and even grease and oil on them. Factory plants: some factory plants have heavy dirt and emulsified oils to clean. It is essential for the long life and safety of their machinery that they keep it clean. Cleaning businesses: mobile cleaning businesses can do a variety of jobs. They may very likely have some tough cleaning jobs. Hot water pressure washers are very useful for this business. Agriculture and farm equipment: this equipment can get quite dirty and also can be in need of sanitizing. These hot water machines can help to keep equipment clean and running well. Different types of machines: there are many different models of these machines. Some are electric, others diesel and some are gas powered. Electric: these models range from 1000 PSI to 4000 PSI. They have a range of 2 HP to 10 HP. They run quieter than gas and diesel machines. These hot electric power washers can be portable, which is ideal for cleaning businesses. They are also good for businesses that need to move the unit around, like auto detailing. These machines can fit into smaller spaces, which is convenient for getting into hard to reach places. The burners can be diesel, natural gas or gasoline. Gas: there are also portable models of these machines. The advantage of gas is that you will not need an electric cord for your hot gasoline power washers, which can be very convenient where there is no electric outlet. This can be especially good for remote areas like farms, and when you have to clean a number of vehicles and equipment at a construction site. Diesel: will save you money as opposed to gas. These diesel stationary hot power washer models are sturdy, durable machines that also come in portable hot water models. Safety: there are certain safety precautions that you should follow when using these pressure washers. Always maintain the heat coils. This will prevent possible malfunctions and even explosions. Scale from detergents can build up on the coils resulting in clogging and malfunction. Hard water can also cause clogging. Soot deposits can accumulate around the walls causing deterioration in performance. Winterizing and storage: it is important to maintain your machine when it is not in use. Do not let your machine stand out in freezing temperatures. You should put anti freeze into the float tank. For direct drive pressure washers, you will need to leave anti freeze in the water system. Want to read more on hot water pressure washer and their equipment? Pick the right equipment, read our power washers guide book.